Taher Sellami has done it again! This time, he has made a extension with 96 Emojis! This entry was posted in Chat Codes and tagged chat, chrome, code, codes, Emoji, Emojis, emoticons, extension, facebook, firefox, google, google chrome, greasemonkey, pictures, smiley, smileys, Taher Sellami, userscripts. Bookmark the permalink. 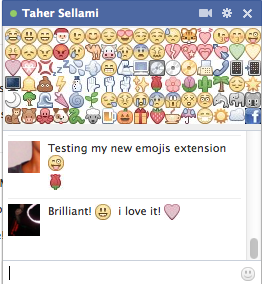 4 Responses to New extension, with Emojis! How can I delete it once I’ve installed it?